THANKS FOR SUPPORTING OUR VEGAN BAKE SALE FOR HAITI RELIEF LAST MONTH! WE HAVE NOW RAISED OVER $1,800 FOR HAITI RELIEF! February 17, 2010: Katy Health & Wellness Meetup Film Screeing of "FOOD, INC."
February 23, 2010: Spay-Neuter Assistance Program's (SNAP) Annual "Neuter Scooter for a Nickel"
Join members of the Houston Health Association/Natural Hygiene Network for their monthly meeting. This month, they will be meeting at A Moveable Feast Cafe in Houston, where there are a variety of vegan options available. There will be a short presentation on vegan health following the meal. Join the Houston Vegan Meetup for their social Dinner on Saturday, February 6 at 5:30 PM. This month, the group will be meeting at Field of Greens Restaurant in Houston, where there are a variety of vegetarian & vegan options available on the menu. The Animal Law Society of South Texas College of Law presents "Texas Politics: Passing Animal-friendly Legislation in a Not-so-Animal-friendly State". This event will feature Texas Humane Legislation Network President Rick Bousquet and THLN Southeast Chapter President (and Society of PEACE member!) Brian Craft. The public is welcome to attend this educational event. The event begins promptly at 4:00 PM at the South Texas College of Law on San Jacinto, Room 517. Light refreshments will be served. For more information on the event, please contact Christina Fojas via email. Christina is a Society of PEACE member and a representative of the Animal Law Society. Join members of the Houston Vegetarian Meetup for their next social Dinner. The group will be gathering on Thursday, February 11, 2010 at ZPizza Restaurant in Houston. This restaurant offers vegan pizza with the new Daiya Vegan Cheese! The event begins promptly at 7:00 PM and seating is limited. Please RSVP online at the Houston Vegetarian Meetup. The Houston Vegetarian Meetup is organized by Society of PEACE members Michelle, Mari, Robert & Lisamarie. Leisure Learning Unlimited presents "Save the Planet: Eat your Veggies RAW", featuring raw vegan chef & KPFT radio personality Pat Greer. The raw vegan class is on Sunday, February 14, 2010 from 1:00 - 4:00 PM in Memorial Park (I-10/Washington) in Houston. This class will focus on Raw Vegan Recipes. Pat will teach you how to have fun preparing and eating food that is made without any heat, such as pizza, lasagna, “re-tried” beans, pecan pie, and more. Make a soup, salad dressing, a veggie parte' dip, marinated mushrooms, and a pecan pie dessert. Recipes will be provided. Katy Health & Wellness Meetup Film Screening of "FOOD, INC."
Join members of the Katy Health & Wellness Meetup for a film screening of "FOOD, INC." at the Alamo Drafthouse. The public is welcome to attend this event, which is also a fundraiser for the Houston Food Bank. Attendees should bring 5 cans of vegan food to donate to the Houston Food Bank. The film begins at 7:30 PM, with seating open at 7:00. Admission is the price of an adult theater ticket. The Alamo Drafthouse in Katy is located on Mason Road. For more information, please visit the Katy Health & Wellness Meetup. Vicki Cummings is the organizer of this meetup. Join the Woodlands Vegan Meetup for their social Dinner on Friday, February 19 at 6:30 PM. This month, the group will be meeting at Dimassi's Mediterranean Buffet in the Woodlands. The restaurant offers a variety of vegan options on the buffet. The event begins promptly at 6:30 PM. Please RSVP online with the Woodlands Vegan Meetup. 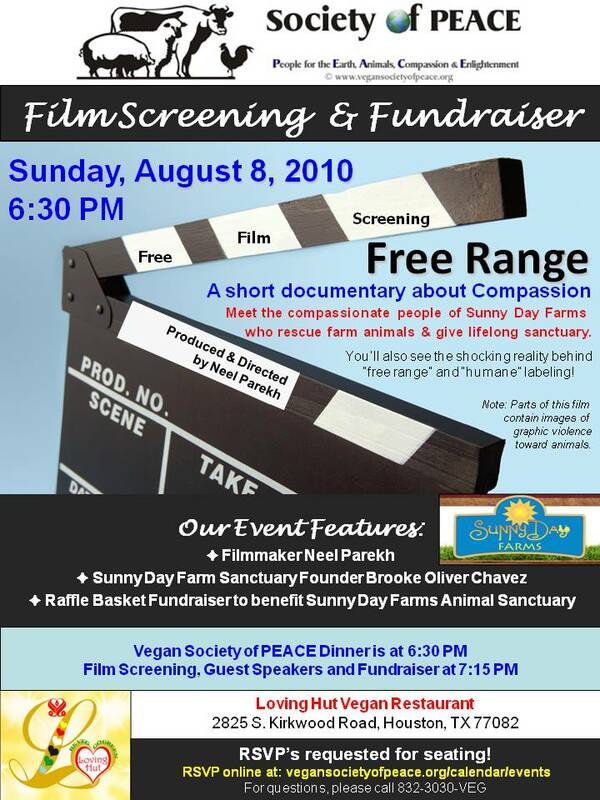 The Woodlands Vegan Meetup is organized by Society of PEACE member Michelle Steiner. Join members of the Houston Veggie-Lifestyle Meetup for a social Dinner. This new group will be gathering on Saturday, February 20, 2010 at Loving Hut Vegan Restaurant in Houston. This 100% vegan restaurant offers the cuisine of Asia, India and traditional American fare, as well as vegan desserts. The event begins promptly at 6:00 PM and seating is limited. Please RSVP online at the Houston Veggie-Lifestyle Meetup. The Houston Veggie-Lifestyle Meetup is organized by Alexandra. The Spay-Neuter Assistance Program (SNAP) is holding their Annual "Neuter Scooter for a Nickel" at 3 locations in Houston and San Antonio on Tuesday, February 23rd in honor of National Spay Day! The goal is to neuter as many male cats in one day for just a nickel and help prevent companion animal overpopulation (which leads to high euthanasia rates!). Three locations will be offering this program between the hours of 7:00 AM - 6:00 PM. Appointments are required and there is a limit of 2 cats per household for appointments. Please visit SNAP's website for specific instructions and a list of participating locations. You may also call 281-999-8531. Join the Spring-Woodlands Raw Vegan Meetup for their monthly Potluck Dinner on Tuesday, February 23rd. This month, the group will be meeting at a private residence in Spring to enjoy a delicious raw vegan potluck. The theme for this event is "Asian Cuisine". The event begins promptly at 6:30 PM. Please RSVP online with the Spring-Woodlands Raw Vegan Meetup. The Spring-Woodlands Raw Vegan Meetup is organized by Society of PEACE member Alicia Moncur. The Houston Humane Society is holding their Annual "Fix Felix for Free" Day on Wednesday, February 24th. The goal is to help prevent companion animal overpopulation (which leads to high euthanasia rates!). The first 500 male cats will be neutered for free!!! Appointments are required. Please call 713-433-6421 or visit the Houston Humane Society website for specific instructions and additional information. You may also email fixfelix@houstonhumane.org for details. The Houston Animal Rights Team will be leafleting at the Houston Rodeo Parade and also holding an Anti-Rodeo Protest on Saturday, February 27th. Protestors will be gathering to hold signs and distribute materials about rodeo cruelty and violence outside the Rodeo arena. The protest begins at 2:00 PM at the corner of Kirby and the South Loop. The parade leafleting time & location will be announced soon. Signs and materials at both activities will be provided by HART. Alma Williams is the director and organizer of HART, and is also a member of Society of PEACE. For more information, visit the Houston Animal Rights Team or call 832-380-4278. Join the Houston Veggie Potluck Meetup for lunch on Sunday, February 28th. This new meetup will be holding their potlucks at a private residence in the Montrose area each month and all ages are welcome to attend. Please bring a vegan dish to share with the group. The potluck lunch begins at 12:00 Noon. To RSVP or for more information, visit the Houston Veggie Potluck Meetup online. The organizer of this meetup group is Teresa Nunes. Vegan Cooking Class: "Vegan Organic 101"
Leisure Learning Unlimited presents "Vegan Organic 101", featuring vegan personal chef & KPFT radio personality (and Society of PEACE member) Staci Davis. The vegan cooking class is on Sunday, February 28, 2010 from 3:00 - 7:00 PM in Sharpstown area (SW Frwy at Fondren) in Houston. Learn to cook with fresh, pure, unadulterated food. Get the most out of the nutrients and savor the wonderful flavors. Staci will teach you how to make dishes from the five major food groups: grains, beans, vegetables, fruits and proteins. Discover what oils to use with what foods. Among the dishes you'll prepare in this hands-on class are a savory tart, an elegant bisque, salads with dressings, and even cookies. Enjoy one smoothie and learn to make many others.